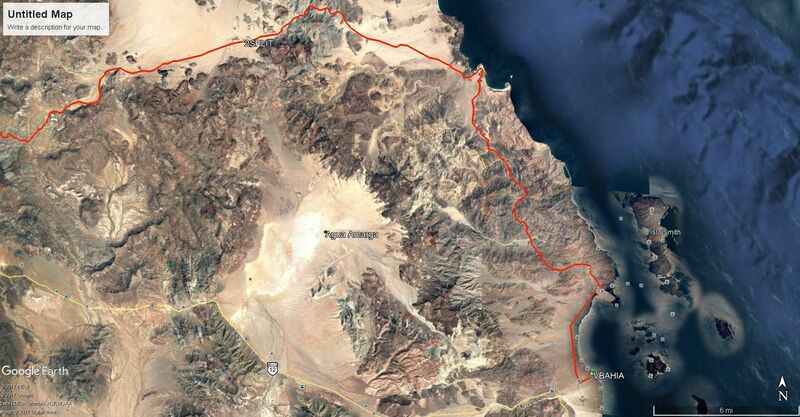 The Window Rock trail goes north out of LA Bay toward Bahia Guadalupe then west going near Yubay. The trail is mostly single track. Looks like it goes from the copper mine north-west from La Gringa. 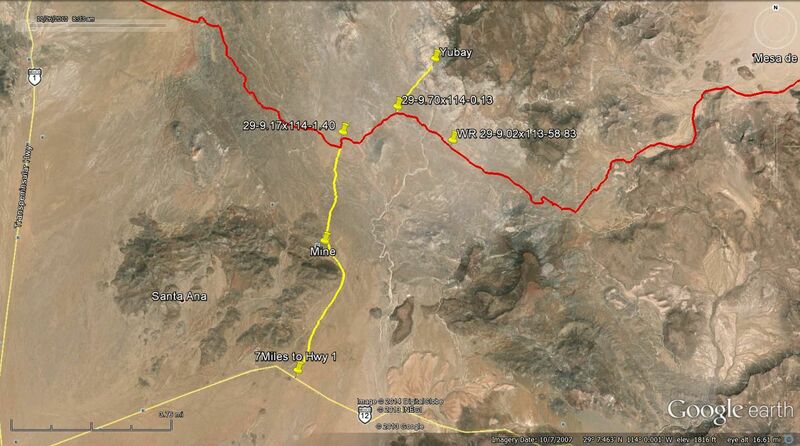 That must be a crazy m/c ride as the is a mountain all around there and no 4x4 road goes beyond. Did Bill Nichols create it? WOW!!! Yes Bill Nichols first did it. When I zoom in on GE it follows mostly arroyos from LA Bay. Bajaseve did it a couple of years ago with a group and sent me the file. After awaking from our turkey coma we cleaned up and moved on. We spent some time exploring the Bahia Guadalupe environs before driving back to BOLA to stock up on cokes and snacks. The kids are developing a taste for spicy Mexican potato chips and I can’t blame them. We went south towards San Borja with a side trip to Montevideo to see the paintings. I was surprised to see a large mule deer there that was a little darker in coloration but otherwise very similar to the deer that raid our flowerbeds back home. We took so much time wandering the cliff line that the sun was nearly down by the time we returned to our truck. We did not make San Borja before we got too tired and spent a glorious star filled night among the boojum trees and cactus. We arrived at San Borja early the next morning and had a great tour of the mission and grounds. The guide told us that he rarely sees gringo niños there. He confirmed what all of our friends said about us being crazy for driving our kids to Mexico. I’ll take crazy if it means days on deserted beaches and touring lonely relics. We descended back to route 1 way ahead of schedule for the first time on this trip. Heading north we took the turn off to Santa Rosalia to look for more tacos. We didn’t find tacos but did find some fun on the beach west of town. There were many blue jellyfish washed up on the beach and in the waves. My kids decided they will take swimming in Tahoe’s cold waters over the monster infested warmer ocean any day. We need to make some friends that can teach us about the ocean. Desperate at that point we drove back to Bahia Gonzaga and got our Taco fix at Alfonsinas. The place was nice but a little too country club for us. We enjoyed the views and tacos before disappearing out into the desert for the night. North of Nuevo Rosarito, where the San Borja (west) road meets Hwy. 1... and then a wide paved road to the coast, at the failed marina project 'Escalera Nautica' from a dozen years ago. Montevideo is a grand place and the boojums are huge near there! Thank you and keep it coming, please! David, Santa Rosalillita is the place. Google maps lists it as Santa Rosalita but it was the longer name on the paper map. Yep, one of the places where there is more than one spelling. It was Santa Rosalía originally, but after the French used that name for their copper mine town, to avoid confusion the little Pacific bay changed to "Little Santa Rosalia" which is Rosalillita and alternately spelled (incorrectly) as Rosaliita. Feeling more than a little stiffed by our fears of the ocean we looked for alternative swimming holes. Prior google earth searches showed an interesting spot west of Gonzaga bay. We camped at the end of the road in a wash and the next morning followed the tracks west up a beautiful winding granite wash with more palm trees and more evidence of water with each bend. The hike was brutal, the first half was deep sand and the second half was over, under, and around huge boulders. I figure it was about 5 miles each way. The swimming hole at the end was worth every step! Paradise! Other than a few bugs and frogs there seemed to be nothing that might eat or sting us in that water!! Our kind of place! We swam for an hour with lots of cliff jumping before it was time to head back. 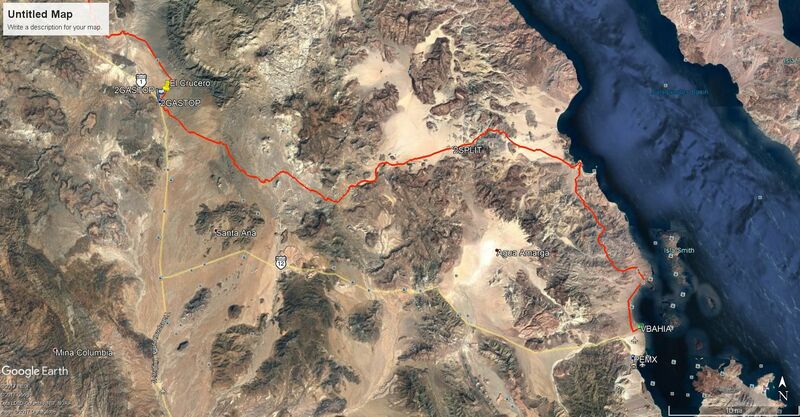 We again drove in the dark back to San Felipe. I guess that if there is a road to drive in the dark, it's that one. We filled up on more tacos before another drive into the desert for a night among the cactus. What a great family vacation. Making memories the kids will never forget. Wonderful, you were just a couple miles from Mission Santa María! The original El Camino Real was in that canyon but was too difficult for mules to transport people and supplies in. A new trail was made that stayed out of the canyon and went up on the north ridge when the Franciscans took over the missions in 1768. Where the road from Hwy. 5 meets the sandy arroyo, just outside the canyon entrance, the new El Camino Real climbs out of the arroyo on the north side and enters a side valley from which it soon goes to the north rim of the canyon. What a report and as others have said, lucky kids to have parents like you! 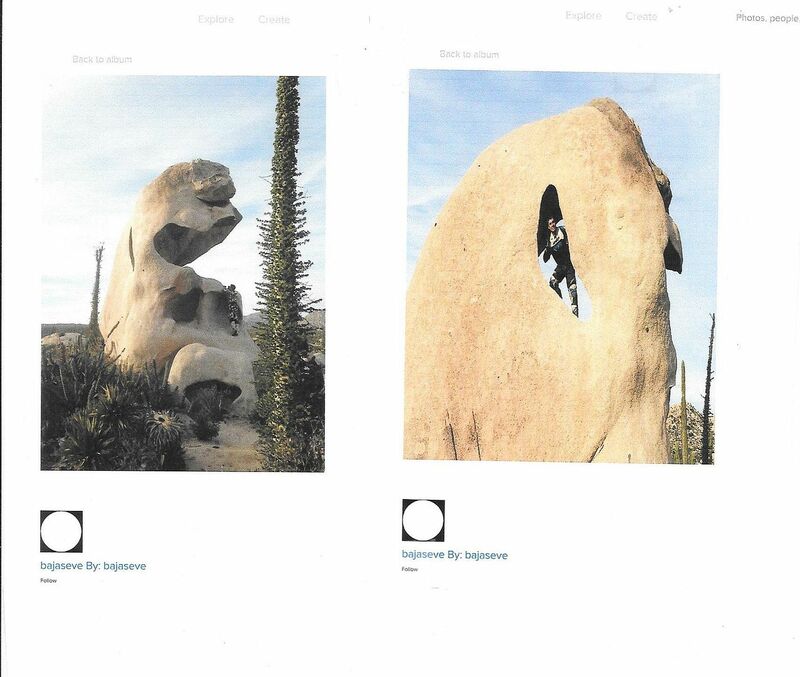 Wow beautiful country and pictures, thanks. Just a note should you go back to Baja. I don't remember ever having any problems with sting rays on the pacific side. I have caught them but never had a problem in the surf. Others on here can correct me if I'm wrong. I remember one trip at LA Bay where we were snorkeling and there must have been a million near the beach. On the last day we were feeling sad that our trip was almost over. We could have simply headed up Mex5 and taken the easy way out via Mexicali but...tacos. Our fascination with Baja started at Christmas time several years ago when all five of use were living cramped into a two bedroom apartment. My wife and I decided that travel seemed a better option for christmas presents rather than more toys to try and find a place for. Our budget was pretty tight but she found a cheap Carnival cruise out of Long Beach. She has a degree in finance and figured that it would be much cheaper to cruise than staying in hotels and eating in some random city. I reluctantly agreed to go along only because it was cheap. I'm not much of a cruiser. When the cruise ship docked in Ensenada we walked off the ship and turned away from the tourist street and wandered the town. Suddenly a light from heaven shown down upon a lowly street taco stand. The glory of the tacos there shown round about but we were sore afraid. Will we die if we eat street tacos? We inched closer and there, wrapped in white waxed paper was breaded fish laid in a tortilla because there was no room for it in a bun. There were in the same tortilla, salsas and lime juice surrounded by shredded cabbage. With the first bite there was suddenly a heavenly host singing hosanna! Hosanna! Glory be to the Ensenada street fish taco! Our whole family was converted instantly and our kids baptized themselves with taco juice running down their shirts. We became Nomads at the intersection of Espinoza and Calle Quinta. Long Live Tacos Fenix!! Yes, we drove 3 hours out of our way on route 3 and then waited another 4 hours to cross the border at TJ just for some street tacos. Now we are afraid that if we DON'T get street tacos we might die!! Thanks for coming along on our (certainly not last) trip to Baja!! That is a fantastic story canoe4me... Thank you so much for sharing your Baja Joy with us here! Great trip and yes there are stingrays on both coasts. "Suddenly a light from heaven shown down upon a lowly street taco stand. The glory of the tacos there shown round about but we were sore afraid. Will we die if we eat street tacos? We inched closer and there, wrapped in white waxed paper was breaded fish laid in a tortilla because there was no room for it in a bun. There were in the same tortilla, salsas and lime juice surrounded by shredded cabbage. With the first bite there was suddenly a heavenly host singing hosanna! Hosanna! Glory be to the Ensenada street fish taco! Our whole family was converted instantly and our kids baptized themselves with taco juice running down their shirts." Yes, we drove 3 hours out of our way on route 3 and then waited another 4 hours to cross the border at TJ just for some street tacos. Next time when leaving Ensenada, drive up thru Valle De Guadalupe to Tecate, much better crossing there and you are only 35 or so miles from San Diego once you cross. 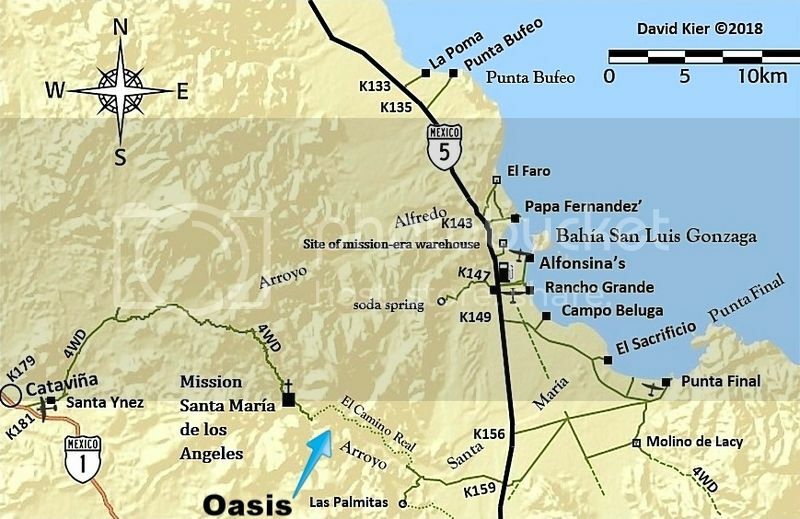 The map link shows the oasis they hiked to, but calling it a "Cataviña oasis" is a bit of a stretch. It is closer to Gonzaga Bay in the time to get to and road + hiking distance. While nothing historically has called it that, at some point, it got named La Poza de Escuadra. Kind of like when I named the grade near Mission Santa Maria "The Widowmaker" in 1999 or the sand island near Percebu/Bahia Santa Maria "Shell Island" back in 1978! There are several YouTube videos if you search "Escuadra". That is the spot! I called it Oasis Cataviña because that’s what it was called by a Mexican ecotour company in their YouTube videos while guiding guests to that location. They appeared to be guiding other Mexicans. I’ll call it what the locals call it. It’s totally worth the hike. The name "Mexico" seems to have given it is: "La Poza de Escuadra", but as the case of any place named, it depends on who repeats it. That name seems to work best for YouTube videos of it. It is in the canyon of Arroyo Santa María, midway between Cataviña and the gulf coast ("Gonzaga Bay").